MACAddressView is an MAC address lookup tool that allows you to easily find the company details (company name, address, and country) according to the MAC address of a product. In other words, MACAddressView also allows you to find MAC address records according to the company name, company address, or country name. After finding the desired MAC address records, you can save them into text/XML/HTML/CSV file or copy them to the clipboard and paste them into Excel or other applications. MACAddressView doesn't send any request to a remote server, it simply uses the internal MAC addresses database stored inside the .exe file. MACAddressView is a very fast application developed to find a MAC address based on user-defined information such as company name or address and country. 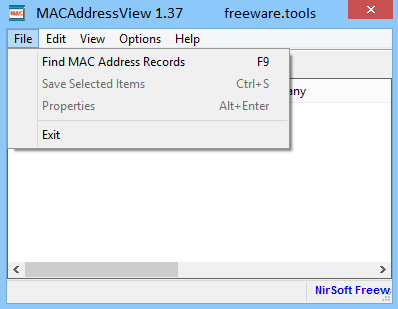 Every time you launch the app, MACAddressView loads the “Find MAC Address Records” dialog that lets you select the search criteria and input the necessary information. For example, you can search for a MAC address by company name, company address or country name. All results are displayed in a well-organized window that presents all the aforementioned details for each item. Results can be exported to TXT, HTML or CSV, while MACAddressView also offers report generating features for either all items or just the user-selected ones. There are no configuration options and that's a truly good thing given the fact that all the essential options are nicely integrated into the main window. This way, rookies and those more advanced can give a try to all built-in features with just a single click. MACAddressView doesn't require more than average computer experience and it runs smoothly on all Windows versions, of course without the need for administrator privileges when launched on Windows 7 workstations. It doesn't comprise a help manual too, but that's alright given the overall intuitive approach. To sum up, MACAddressView is almost the best you can get when it comes to obtaining information about a specific MAC address. Although the same thing can be performed online too, MACAddressView brings all you need in offline mode, without even hampering your computer performance.